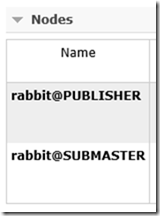 So far on this blog, we’ve been looking at the publish/subscribe messaging pattern using MassTransit and RabbitMQ. So far, we’ve dealt with a single publisher and a single subscriber. We looked at how we can have those two roles live on separate servers. Finally, we looked at how to handle errors in the subscriber. What happens, now, when your subscriber can’t process messages as fast as the messages are being published on the bus? This is a special situation, to be sure, but it certainly is possible in high message volume environments. It can be compounded if the messages themselves are fairly expensive to process. Let’s take our simple publish/subscribe example and tweak it so we can have it dump a large number of messages onto the bus extremely quickly. Originally, the example prompted for a string and published that string as a single SomethingHappened message. Instead, let’s prompt for a number of messages that should be put onto the bus. We’re using the System.Threading.Tasks.Parallel.For method to be able to simultaneously publish multiple messages onto the bus. Now in our subscriber, let’s have it simulate 250 milliseconds of processing time with a call to System.Threading.Thread.Sleep. Also, because MassTransit will run 4 threads per CPU for our consumer and the messages will be flying in, we’ll condense our Console output to a single WriteLine call instead of multiple calls to Write so as to avoid the output from multiple messages getting jumbled together. The test code for this example can be found on github. As you could probably see, the prompt on the publisher returned well before the subscriber finished processing the messages. 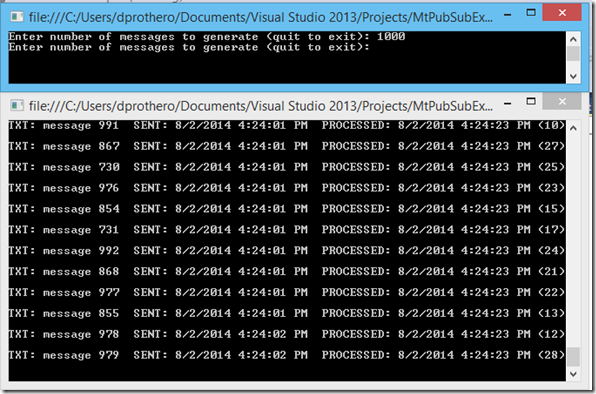 This means we were able to publish messages to the bus faster that we could process them. This could be a problem if you don’t expect any “lulls” in publishing which would allow the subscriber to catch up. Here you can see that the publisher hit a peak of 200 messages per second, while the subscriber sustained a steady rate of about 40 messages per second. This more dramatically illustrates the problem. The number of queued messages (top graph) is continuing to go up with no relief in sight. And the bottom graph shows we’re publishing messages at a rate of 259 per second, but we only process them at a rate of around 40 per second. Again, since the publish storm eventually passes, the subscriber does eventually catch up. 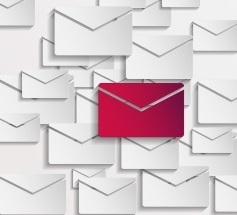 Let’s look at a couple ways we can increase the throughput of our subscriber. If you do the math on the rate of 40 messages per second that we observe, you will arrive at what appears to be 10 simultaneous threads processing messages (each message takes a quarter of a second). However, the default number of threads that MassTransit can use for consumers is actually the number of processors in your machine multiplied by 4. So, on my 8 core machine, that would be 32 threads. Why are we only observing 10? Now that this is set to 32 to match the maximum thread of 32, we should observe a 128 message per second processing rate. Don’t forget to also increase your prefetch setting (see option 1 above) to match. 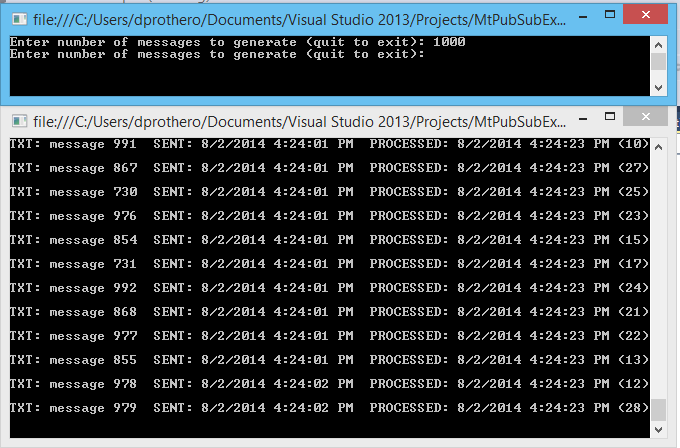 Now we’re processing 256 messages per second! That’s pretty close to our 259 per second we observed being published onto the bus. However, at some point, your machine is going to run out of processing power. Perhaps it already has. We’re just sleeping the thread here for 250ms, so the ceiling is pretty high on how many threads we could run, but if there was real processing happening, we might be maxing out the CPU on the machine. As any good architect knows, don’t scale up, scale out! Try dumping another 10,000 messages onto the bus. While you’ve got one subscriber running, you can simply execute another instance of the TestSubscriber executable and it will start processing messages too, effectively doubling your processing rate! 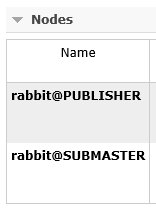 Having multiple subscribers connected to the same RabbitMQ queue is what’s called the “competing consumer” pattern. RabbitMQ will make sure each consumer gets unique messages in essentially a round-robin fashion. 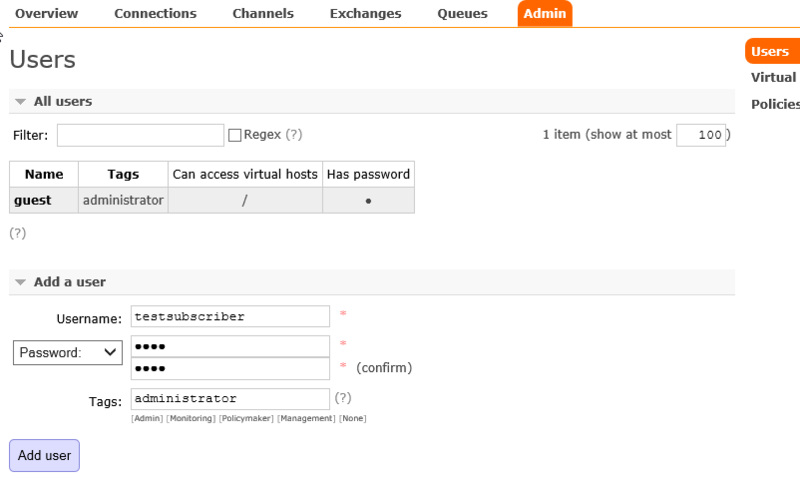 Obviously, this makes the RabbitMQ server a single point of failure and a dependency for the two subscriber machines. If high availability is a requirement, then you would need to look into some type of virtual IP address based clustering (like keepalived on Linux or NLB on Windows). 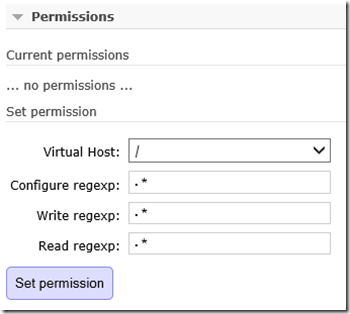 You will also need to implement highly available queues in RabbitMQ so that the queues are replicated across your multiple instances. Now we need to modify our Configuration.BusInitializer class to be able to connect to a specific machine name instead of hard-coding localhost as well as utilize our username and password. We’ll have it read these items from our App.config. Remember, our publisher can still use localhost (which doesn’t require username/password), but our subscriber needs to connect to the submaster machine with some credentials. Great tutorial David, it helped me a lot. Though i have one question about Runtime Services. My Runtime Services are also running on “submaster”, how can i use credientials for this server while using Subscription Service from Publisher. When i call UseSubscriptionService, how can i authenticate? Runtime Services are only necessary for MSMQ. I do not have any experience using MassTransit with MSMQ. 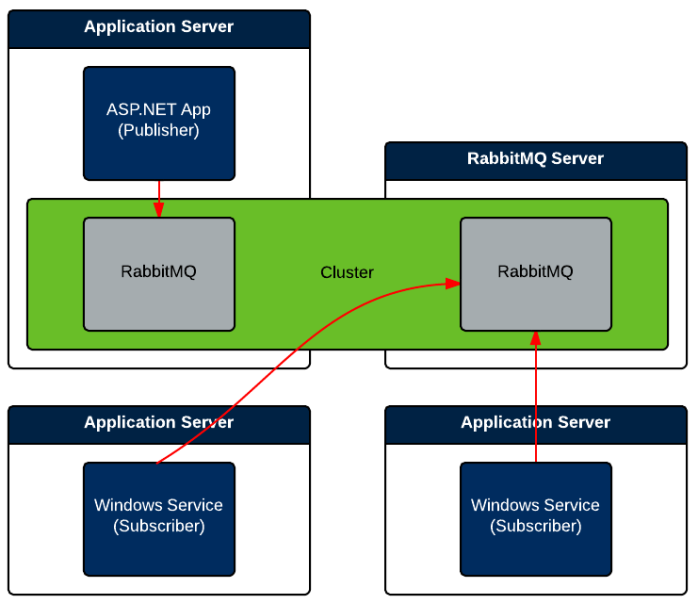 When using RabbitMQ, there’s no need for the Runtime Services because RabbitMQ handles all of the subscription persistence for you. Also, FYI, MSMQ support is being dropped in MassTransit 3. Thanks David. Actually i need to check nodes health and show to client. For that i was using Health Services, and Health Services can only be used with Runtime Services (Subscription Services). Any idea how can i store nodes health in database? Again, I haven’t used any of MT’s runtime services, including the health service. Personally, I use Nagios for infrastructure monitoring (http://www.nagios.org/). Perhaps more important than the health of an individual node is the health of your queues. 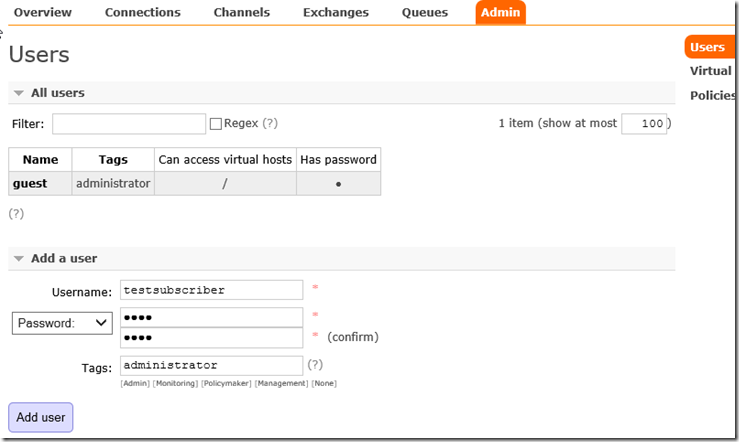 Take a look at http://looselycoupledlabs.com/2014/08/monitoring-rabbitmq/ for how to keep an eye on your queues. For services, I usually setup in Nagios what are called “passive checks”… Nagios doesn’t actively ping the services, but expects the services to “report in” on a set interval. You could roll your own simple variation of this. Have each note report in to a database to say “I’m still alive as of this timestamp” and then write a centralized script or program that monitors that database for stale report times (the assumption being if a report time is over X minutes old, then the node is having problems). Thanks David, actually i have setup the health services with help of your post “RabbirMQ Monitoring”. 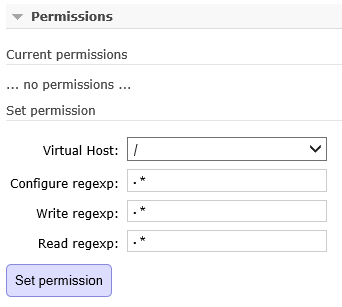 I don’t thing that you have to connect to the same RabbitMQ instance when using competing consumers. 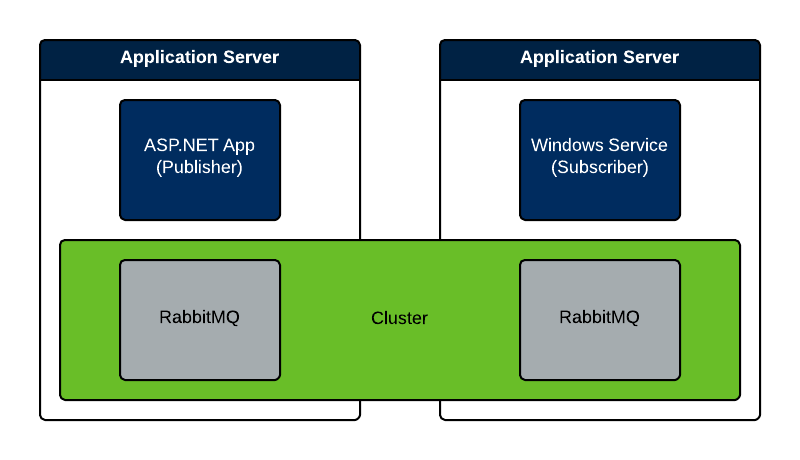 The two subscriber processes can be connected to different RabbitMQ instances in the cluster using the same queue name.